Winter isn’t far off and you know what that means: colds, flues and, assorted respiratory infections. Why not start boosting your immune system before winter settles in? Only this winter, you’ll want to try utilizing the amazing immune-boosting spice known as garlic. As the weather cools and seasons shift, preserve your health, fortify your internal defenses, and eradicate seasonal illness with warming spices and foods like a 52 clove garlic soup. Real food is the best medicine money can buy. Remember the cure is in the kitchen! The Greeks, Egyptians and Romans effectively used garlic to treat a host of ailments including infections, digestive problems, and high blood pressure. Many Italians even used to send their children to school with garlands of garlic around their necks to prevent colds. During World War 1, British army doctors successfully treated life threatening infections by applying raw, garlic juice diluted with water directly to wounds. Russian army physicians used the same garlic protocol in World War II with the addition of garlic and onions added to the diet. Many of the health benefits of garlic are due to an active compound known as allicin. Allicin is the compound in garlic that gives it its pungent odor as well as its powerful health benefits. A mere one milligram of allicin is nearly 15x as potent as penicillin. The compound offers a broad spectrum of protection against pathogenic bacteria, viruses, parasites, antibiotic resistant MRSA, yeast infections, and is even one of many amazing cancer-fighting foods. Garlic contains 33 active sulfur-containing substances. When ingested, allicin converts to sulfenic acid, which is the fastest acting free radical eliminator bar none. Recently, the University of Florida found eating garlic increased the number of virus fighting T-cells in the bloodstream. Savvy health experts increasingly promote eating whole foods as a foundational healing method as opposed to taking supplements, especially when it comes to garlic. 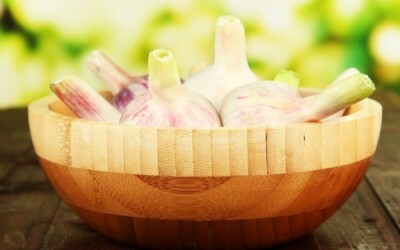 Eating garlic is by far the best way to ensure garlic’s numerous health benefits. Most consider the proper way to eat garlic for health purposes is to first smash a whole fresh clove with a garlic press, or chop it, or smash it with the back of a knife. Then wait about 5 minutes before consuming. This ritual activates the potent, medicinal allicin in garlic. Caveat: If you buy powered or jarred garlic, you will not experience the full spectrum of medicinal benefits that garlic offers. This soup recipe incorporates all the above recommended methods of maximizing garlic’s health benefits, and it’s delicious! Preheat oven to 350F. Place 26 garlic cloves in small glass baking dish. Add 2 tablespoons olive oil, sprinkle with sea salt and toss to coat. Cover baking dish tightly with foil and bake until garlic is golden brown and tender, about 45 minutes. After cooling, squeeze garlic between fingertips to release cloves. Transfer cloves to small bowl. Melt butter in heavy large saucepan over medium-high heat. Add onions, thyme, ginger, turmeric, cayenne powder and cook until onions are translucent, about 6 minutes. Smash 12 raw garlic and set aside. Add roasted garlic and 14 raw garlic cloves and cook 3 minutes. Add vegetable broth; cover and simmer until garlic is very tender, about 20 minutes. Working in batches, puree soup in blender until smooth. Return soup to saucepan; add almond milk or substitute and bring to simmer. Add 12 smashed garlic to finished soup and stir. Season with sea salt and pepper for flavor. Most of this article is not true and citing your own website and a guy who has no qualification whatsoever to dispense health advise does not help your article. In fact, it pretty much flings it into the trash bin. “fortify your internal defenses”? What does that even mean? That said, at least it’s delicious and not something you’re selling… or are you? oh really you have the answer I guess? Shut up already! I am SOOO tired of reading EVERY reply you post where you negate EVERY article!!!! Why are you wasting your time reading these articles? What is your goal here? Do you really think people are listening to your negativity? Even if you do bring up good points, I DO NOT want to analyze them because of your attitude. What qualifications do you possess to question others? Do you have facts to back up your claims that “Most of this article is not true..”? This is a reply I posted in response to one of your other replies, which I am sure you did not see. Can you address my last question? RealityCheck, are you on a mission to debunk every article on this web site that MAY help people improve their health? Instead of negating every article, do you have any valuable suggestions? Do you have resources to back up your claims? I don’t necessarily agree with all that is written in these articles and in fact, I find that information is often omitted or not presented clearly, but I analyze what I read and I draw my own conclusions. Why are you reading these articles if you find faults with just about every single one? Isn’t this a waste of time for you? I am curious, do you find issues with the idea of allowing the body to heal naturally and avoiding toxic “medications” that our conventional medical doctors are so quick to prescribe these days or is it something else? “Most of this article is not true..” ? What does that even mean? Explain yourself, please.